Running FAQ's...Is running bad for my knees? Are good running shoes important? Is running bad for my knees? How important are good running shoes? Is stretching important? Which stretches should I do? We have answers from a panel of experts for the Frequently Asked Questions about running. BOOST PHYSIO specialises in treating and curing all types of running injuries, whether it’s your first 5km or 50th marathon- we will help you. 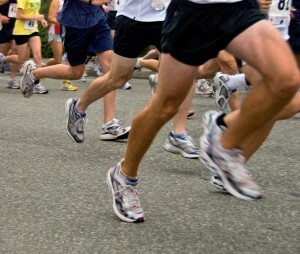 Question: How important are good running shoes? Mr Nick Cullen (Consultant ankle and foot surgeon): In my opinion when running good training shoes are very important when, it is often a good idea for those who take up running to be assessed by their physiotherapist or local specialist running retailer in order to purchase the correct shoes for their foot-type. A slight flatter foot type may benefit from a shoe with more support. It is important that trainers are changed on a regular basis, for those running moderate distances they should consider changing their shoes every six to twelve months. Those who run long distance need to change more frequently. Read the full BOOST PHYSIO interview with Mr Cullen here. Absolutely says BOOST PHYSIO Clinical Director, Steven Berkman who has run 3 marathons and completed 5 triathlons. All runners should spend time stretching key areas such as the quadriceps, hamstrings and gastrocnemius muscles. Stretching helps prevent injury by keeping the muscles supple and mobile and prevents muscles from gradually shortening (which is very common amongst runners, particularly those like me over the age of 30). Stretching aids recovery too and helps prevent that sore achy feeling of DOMS (Delayed Onset Muscle Soreness) feeling which comes about from micro-trauma to the muscle and connective tissues in the muscles. Stretching is slow controlled sustained hold of a stretch position of the particular muscle to increase the muscle length. in my opinion, all runners should do two 20 second stretches for each quadricep, hamstring and calf muscle- at least. This only takes a total of 4min to stretch all 3 muscle groups in both legs. Question: Which Stretches should I do? Follow this link to view the 3 most important stretches we recommend to runners. What stretches should runners do? Call us to arrange an appointment on 020 82017788. We are open 8am-9pm and have 2 high street private physiotherapy clinics. BOOST PHYSIO Hendon NW London NW4 and BOOST PHYSIO East Finchley in North London N2.